Though brothers Edward and Alphonse Elric both displayed a major alchemic potential as youngsters, it was Ed who led the way. Not because he was more talented, mind you, but because Al was quieter, more reserved. It was Edward's plan to use alchemy to resurrect their dead mother, and it was that plan that led to Alphonse's sad state today. When they began the ritual, Alphonse nearly died. His body was destroyed immediately, and his soul was just about to fade away when Ed pulled him back: using his own arm as fodder, Edward managed to bind his brother's soul to the nearest suitable object: a large and looming suit of armor. Suddenly the baby brother is a 7' steel behemoth. The design of the armor is really nice - its simple rounded design is more like real armor than all the intricately etched plates that usually comprise fantasy armor. It's got plenty of detail, even if it is all smooth, and shows evidence of having been in a number of battles. 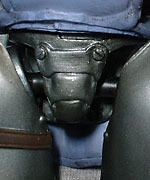 Every little rivet is sculpted, and there are even a few spots (like the knees) with a subtle texture. The armor is mostly tones of grey with brown for the few straps and periwinkle blue for the loincloth. Why does a robot need a loincloth? It's just part of the original armor - it's not like he's swinging ungodly pipe back there or anything. In fact, the only thing behind the loincloth? A cod piece. There's a wash over the whole figure to give the metal a slightly tarnished look, and it works beautifully. You never see anything like this on a mass market toy. Al's articulation is great, since the armor is already designed to look like it has joints. He moves at the ankles, knees, hips, waist, shoulders, biceps, elbows, wrists and neck. In all that, only the elbows and waist aren't balljoints, making this one impressively mobile armor. Okay, so some of the joints aren't true balls, but double-joints that serve the same purpose. The range of motion is still the same. Since Al is much bigger than his brother - 6½", all told - he doesn't get the same mighty array of accessories. In fact, he's just got an extra pair of fists. Oh, and since Al's an animal lover, a kitty. 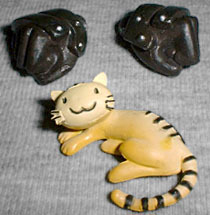 The fists pop on ond off with some difficulty, and the cat is a very cartoony stripped tabby, lounging on its side. It's important to note that Alphonse doesn't reside inside the suit of armor - he's not floating around in the hollow center. He's actually bonded to it via an alchemic symbol hastily drawn by Ed; the iron in the blood used to create the symbol allows little Al's soul to inhabit the actual metal. Because of that, we can open the armor up and take a look inside. 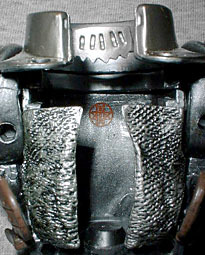 The breastplate is removable, revealing a curtain of mail behind it. A small shelf slides into place at the top of the chest cavity to support Al's helmet... er, head. The fact that you can completely and securely close off the armor makes Al great for storing not only the cat, but the rest of your Fullmetal Alchemist accessories as well. Load him up! Yes, you have to pay a bit more than your average Wal*Mart purchase, since these figures are imported from Japan, but they're worth it. 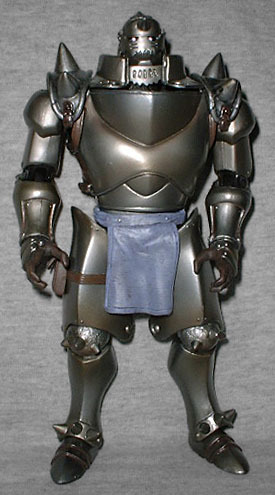 Especially Alphonse, the echo in the armor who just wants to be a real boy again. No matter how good ToyBiz gets, the best combinations of sculpt and articulation come from overseas.